The Maple Leaf Women’s Volleyball team dropped their first of eight straight matches away from Gunden Gymnasium to the Cougars of Mount Vernon Nazarene University on Friday. Following a 5-5 tie, the Cougars strung together two runs of four and a run of five to take a commanding lead and cruise to a first set victory by the score of 14-25. The Leafs got off to a stronger start in the second set as they took a 5-2 lead following one of sophomore Taylor Eash’s team-high 11 kills. Senior Hallie Vanitvelt would stretch the lead to four at 9-5 with a kill assisted by first-year Naomi Willis. Goshen was able to maintain an edge over the Cougars until an ace from the home team drew things tie at 15 apiece. With the momentum shifted, MVNU captured nine of the last 13 points to take the second set, 20-25. In the third set, the Leafs tied the score up six times but were never able to take the lead after a 7-7 tie. Goshen struggled to sustain a consistent attack as seven of their 22 match errors came in the third set. MVNU hit for an impressive 16 kills while maintaining a hitting percentage of .286% in route to a 19-25 final set victory. 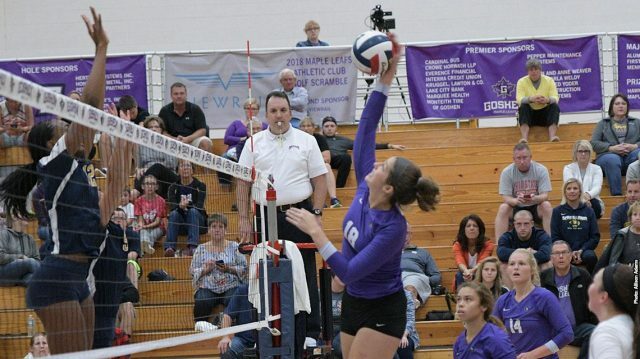 Eash led the Goshen front row attack as she gathered 11 kills and a pair of blocks. Junior Ally Roehr led the team with 18 assists and added two aces. Senior MacKinnon Tracy and Willis contributed to a strong defensive effort with 14 and 13 kills respectively. Goshen drops to 8-14 on the season and 2-8 in the conference. The Maple Leafs will continue their road trip this upcoming Friday as they travel to take on Huntington at 7 p.m.